An Apple invention published on Thursday points to work on water resistant portable devices capable of expelling water from speaker and microphone cavities using varied electric charges and acoustics. 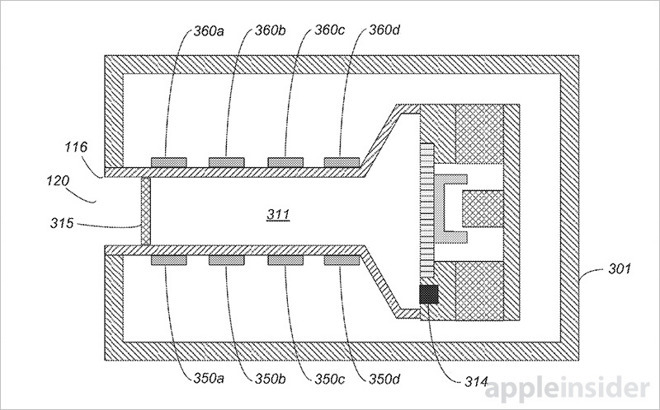 As published by the U.S. Patent and Trademark Office, Apple's patent application for "Liquid expulsion from an orifice" describes a novel method by which water, or any other liquid, is transported out of an acoustic chamber. The general idea is to introduce hydrophobic properties to conductive elements disposed within an acoustic cavity —a speaker or microphone chamber —by varying their respective surface charges. While Apple currently installs a fine mesh screen over device openings to prevent foreign objects and liquid from entering, there is a chance of ingress when immersed or subjected to water under pressure. Further, condensation may accumulate within the chamber, depending on humidity and local temperature fluctuations, a bad situation for sensitive electronic components. In some embodiments of the proposed invention, sensors disposed inside the acoustic module are used to detect the presence of moisture. Other implementations rely on existing acoustic sensors, like onboard microphones, to accomplish the task through tone analysis. If it is determined that liquid has indeed entered the acoustic module, a surface charge is applied to conductive elements lining the chamber's walls. Said elements are configured to conform to the acoustic cavity's shape, for example as a tube-shaped wire coil. Apple notes these conductive elements are covered with a protective layer of dielectric material. Effect of surface charge variation on water droplet. Switching a conductive element's surface charge between positive, neutral and negative modifies that particular region's hydrophobicity, meaning an electrode can be configured to attract or repel liquid. For example, a positive charge might reduce an area's hydrophobic properties, while a negative surface charge has the opposite effect and pushes liquid away. Selectively applying varying surface charges to particular regions allows the system to facilitate movement of a collected liquid, or more specifically transport water toward and out of an exit port. A separate surface charge might also be applied to the protective mesh screen to speed up the process. Finally, Apple says speaker drivers might also assist in liquid evacuation. By outputting energy pulses, or sound waves, that propagate through the acoustic channel, a speaker can push out standing fluid by force. It is unclear if Apple plans to put the water expulsion invention into action anytime soon, but the company already employs passive waterproofing measures in its current product lineup. The iPhone 6s, for example, was found to include a perimeter gasket and silicone-sealed cables, while the Apple Watch boasts a water resistant design, including the completely encapsulated S1 system-in-package. Recent rumors claim Apple is mulling a "ruggedized" next-generation iPhone boasting water- and dust-proof features, though exact specifications were expectedly unavailable. 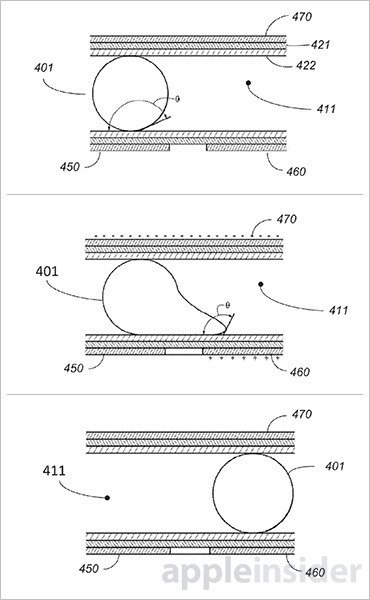 Apple's liquid expulsion patent application was first filed for in May 2014 and credits Stephen P. Zadesky, Fletcher R. Rothkopf and Ashley E. Fletcher as its inventors.